As a vegan (and sometimes vegetarian -- we have slips off sometimes when tempted with things that we grew up on), I always look for new recipes and discussions on things vegetarian/vegan. I'm actually looking for a red velvet vegan recipe if anyone knows of a good tried-and-true recipe. Sorry,I don't have the recipe you're looking for but I'd love to add some new veggie recipes to my collection.Thank you for this thread. I think I found one. I'm going to make it this aft and surprise K with it. It calls for round pans but I'm going to see if I can find some heart-shaped ones at the dollar store. I found it! And it was easy to make (although I had to adjust a couple of things: the store didn't have any vegan cream cheese and I forgot to get baking powder). It seems fine otherwise. First, preheat your oven to 350 degrees and grease 2 round cake pans. Set aside. Then, in a small mixing bowl, mix the soy milk with the vinegar and allow to curdle. In a large mixing bowl, sift the flour, sugar, cocoa powder, baking powder, baking soda, and salt. Once the soymilk has curdled, add the veg oil, food coloring, vanilla, and apple sauce to the milk and stir. Add the wet ingredients to the dry ingredients and mix with a hand mixer until there are no lumps and the batter color is blended thoroughly. Evenly distribute the cake batter into the 2 round baking pans and place them in the oven. Bake for 25 minutes, or until completely done. You can use a toothpick to test whether or not the cakes are finished. Once they are done, remove them from the oven and set aside to cool. Beat the butter, vanilla, and cream cheese until smooth. On a medium speed setting, mix in the sugar about 2 cups at a time. You don’t have to use all 8 cups, but I wouldn’t use more than 8. Refrigerate until its time to frost. When you are ready to frost the cakes, make sure you have plenty of room on your counter top. I like to make this a 4-layer cake, and you can do this by cutting each cake in 2 with a serrated bread knife. You have to be very careful in doing this, because the layers will be thin, but it looks fantastic when where is a nice layer of frosting between each layer of cake. Once you have done this, ice the top and the sides and you’re ready to go! Enjoy with a big scoop of vegan vanilla ice cream! I guess the recipe was ok since K had two slices already this evening. She suggested I open my own bakery. That'd be a bad idea since I'd gain about 300+ lbs from sampling my own wares. the best culinary gourmet egg replacer is called "ener-g", and it is awesome. i will also use flax meal, which adds moisture to baked goods, and you can reduce some of the oil if you like. walnut oil is great for baking. i made a totally vegan banana walnut cake in nordic ware [bake ware], and the physician said it was like "a piece of art". not to mention healthy- low sodium, fat [the good kind! ], and it's balanced with the flours/milk. his staff loved it. just used bananas, flours: soy, fava, sorghum, chickpea; ener-g egg replacer, soy and/or coconut milk, flax meal, walnut oil, local and buckwheat honey, brown sugar, and a bit of vanilla. Working hard on getting back to it, but still like my comfort foods from when I was a kid. Would LOVE to eventually go vegan - maybe some day. Mash bananas. Add the peanut butter, salt, baking soda, sugar and nuts. Stir together until combined. Add flour and stir to combined. Pour into greased baking pan (use soy butter for this). Use a small casserole dish or a 9 x 12 pan to ensure it's evenly baked. Let bread bake for one hour at 350F in oven. Then let cool for 15 minutes before removing from pan. This is a quick recipe and one I do by hand since we don't have a blender or masher. The bread lasts about 3 days max here (there's only two of us) so it goes quickly. You could easily freeze extra portions. Additionally, this recipe is great if you freeze ripe bananas and want to use them later. Just let them dethaw for about 4-8 hours and then use them. You can make the recipe without nuts but the bread will feel denser. If you do make it without nuts shorten the time in the over to about 40-45 minutes as the bread will bake faster. I've also added vanilla and/or cinnamon for an additional hidden flavouring to the bread. Many of those same comfort foods can be vegan/vegetarian. What specifically were your favourites? i should have noted that the cake i made was also wheat/gluten free. linus, thank you for your recipes. links to other sites are good too! I was a vegetarian / vegan for years. I love vegetarian fare, although I now am an omnivore. I am naturally ethereal, and need the grounding..... I need to find Vegan cake recipes, as I am very allergic to eggs. I stopped baking, because nothing turned out well. I saw the red velvet cake Linus posted, and I once again have hope. I sure would love to see more Vegan baked yummies if you have recipes to share! I saw this prepared on the food Network and it looked so good I had to try it. It has become a favorite. The ratio of sweet potatoes to coconut milk is important if you want to get the right consistency. Also I tend to be heavy handed with spices, it was not a good idea here. The recipe is perfectly blended. Butter and flour a 9 by 13-inch baking dish. Using the grater attachment on a food processor, grate the potatoes and put in a large bowl. Add the flour, coconut, raisins, vanilla, cinnamon, ginger, and nutmeg and mix well. Heat the sugar, coconut milk, and evaporated milk in a saucepan over low heat until the sugar is dissolved, about 4 minutes. Pour the coconut milk mixture into the potato mixture and mix well. Pour the mixture into the baking dish, smooth the top, and bake until set, about 1 1/2 hours. 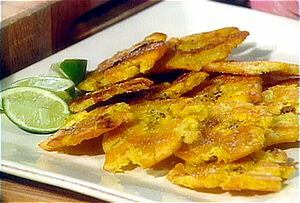 Plantains are usually found in Ethnic markets or placed that have Latin ingredients. They look like really large Bananas, and have a very tough skin. They are used green, where they are not sweet, and ripe where they can be very sweet. These bananas are for cooking, not for eating raw!!!!! This recipe calls for sweet ripe Plantains. The skin will be Yellow as opposed to green. There may be brown spots, which does not mean you can't use them, as long as they are "firm" they are good. Drain and peel the plantains and transfer to a large bowl. Mash to a smooth consistency and add the baking powder, salt, garlic, and pepper. Mix well. Using your hands, form small, thin cakes about 2 1/2 inches in diameter. Heat oil in large skillet until very hot. Fry the cakes until golden brown, about 2 to 3 minutes per side. Transfer to a paper towel-lined plate. Oh.. so which plantain recipe is the sweeter of the two? I remember my mom making those when I was a kid.. 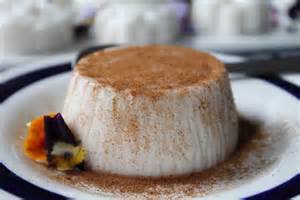 If you like coconut desserts, you will love this. It is simple and smooth as velvet, I did use the orange blossom water, and it adds a wonderful fragrant under tone. I poured it into snow man molds for Xmas. In a saucepan dissolve cornstarch in 1/4 cup coconut milk. Once dissolved add the rest of the coconut milk, sugar, and salt. Cook at medium-high heat stirring constantly! As it thickens, lower heat until it boils thick. Pour right away into wet molds, pans or cups. Cool and then cover and refrigerate for at least 2 hours. Carefully separate the tembleque from the mold using a knife. Turn it over unto a dish. Sprinkle with cinnamon.